Smew is the rarest sawbill in Cheshire and Wirral. Although the species was found in 11 tetrads during this Atlas, there were only 7 birds recorded in the three winters, with no more than one bird present at a time. Two of the meres visited span tetrad boundaries: Chapel Mere (SJ55F/ G/ K) and Tatton Mere (SJ77P/ 78K), and one bird accounted for all four tetrads in the eastern hills, a male in February 2006 moving between Bosley Reservoir (SJ96D/ H/ I) and Tegg’s Nose, Bottoms and Ridgegate Reservoirs (SJ97K), apparently finding sufficient fish in the oligotrophic upland reservoirs. This is probably fewer birds in the county than in any three-year period for many years. Although never numerous, most Smews are found here during icy weather, when the thousands of birds wintering in the Netherlands are driven west or south, but the mild winters of late have meant that few birds have had to move this far. The species undertakes only a relatively short-distance migration from its breeding grounds in the boreal zone of Fennoscandia and Russia. All of the mapped birds were on inland waters; estuarine records are unusual in the county, with the latest being on the Dee saltmarsh for one day each in 1995 and 1999, while the most recent coastal bird, at Leasowe in 2002, appears to have been the first since one off Hilbre in 1980. 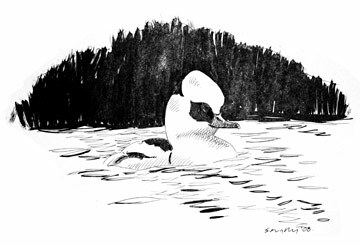 In eastern Europe Smew winter largely at sea, but in the western part of their range they use inland waters (Tucker & Heath 1994). Coward (1910) summarised the species’ status as ‘a rare winter visitor to the coast and inland waters’, and Craggs (1982) lists five records at Hilbre from 1942 to 1980. There appears to be no justification for Bell’s statement that there were ‘many records from the estuaries’ (Bell 1962). It seems that Smew now arrive earlier in the winter than previously. Bell (1962) said that they do not usually arrive until the latter part of December, and frequently are not seen until January. The county bird report for 1984, noting the unprecedented arrival of three birds in November, commented that there had been only about nine previous records in the 20th century, but November birds have been seen in roughly every other year since then. The record for early arrival was set by a male that arrived at Inner Marsh Farm on 7 October 1999 and stayed until 3 March 2000; this could have been the same bird that had been there for the previous three winters. Smews in Cheshire often seem to have a run of years at the same location and one has to suspect recurrence of certain individuals, although there never has been any proof. One or two females appeared regularly at Tatton Mere, every winter for ten years throughout the 1970s, and a male was at Inner Marsh Farm for six winters from 1999/ 2000 to 2004/ 05. Three of the seven birds found during this survey were the strikingly-marked drakes. They are normally in the minority, being outnumbered by females and immatures in their ‘red-head’ plumage. The male’s eclipse plumage appears identical to the ‘red-head’ garb, but most birds have moulted into adult male plumage before arriving here. This moult is quite quick, taking about three weeks: a red-head present at Inner Marsh Farm from 9 November 1996 had moulted into ‘full adult’ male plumage by 30 November that year, and another red-head at the same site from 8 November 1997 had become a smart male by 1 December.